Once you experience the freedom of working wireless, you never want to go back to a traditional handset. 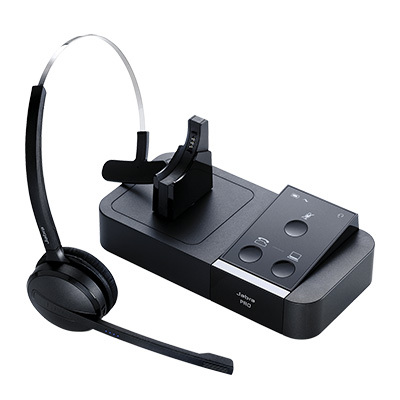 A Jabra PRO™ 9450 headset enables you to multi-task with maximum efficiency, switch between rooms and project groups, or simply work at your desk - while staying up to date and in control of your calls. The future is secured with Jabra PRO™ 9450 headsets offering full UC compatibility. Live internet updates enable you to download the latest firmware, new functionality improvements and free drivers for the latest generation of softphones! All Jabra PRO™ 9450 headsets use DECT connectivity to give you crystal-clear sound and a range of up to 150 meters (450ft) with consistent sound quality. the flip-up screen with touch interface puts call control at your fintertips. Enjoy sensational sound quality. Several state-of-the-art sound technologies enable the Jabra PRO™ 9450 to deliver unrivalled call clarity and safety. Wideband quality ensures the sound you hear is sharp while SafeTone technology protects your hearing.